(S)Edition: Prints as Activism (Winter, 2010) was curated in partnership with the Urban Institute for Contemporary Arts, Grand Rapids, Michigan. 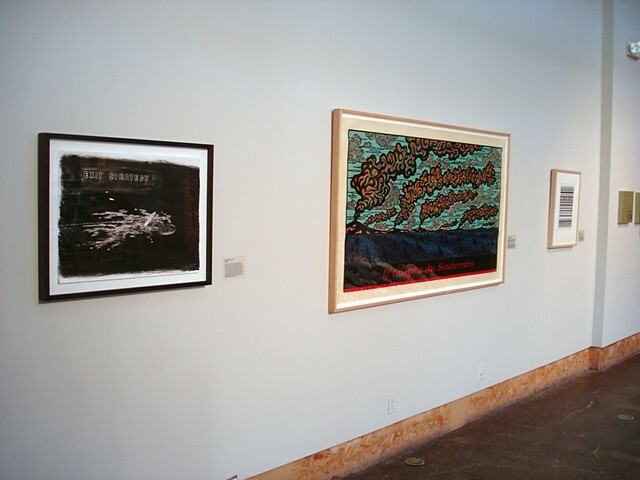 The exhibition featured 70 works by 54 artists from throughout North America. Simply put, sedition is activity tending toward the subversion of the established order. This exhibition features a broad range of such activity, presenting us with works that critique the overt and covert actions of corporations and governments, others that raise our consciousness to dire issues facing this planet, and still others that inspire us to use the resources at our disposal to create, package, and share our own ideas  to create our own order. To some artists, we as viewers become channels of distribution. There are magnets, postcards, and various hand-printed images to be taken freely. These works challenge the familiar gallery experience and undermine the capitalist system itself, rendering those who take the images away complicit in the work. For more than 500 years, printed images and words have served to mobilize and enlighten the literate and illiterate alike. In a fair and just society, it is imperative that information be accessible to all. Without print technology  the means to reproduce and disseminate information for the masses  democracy would struggle to form, or function effectively. Our primary sources for news and editorials  internet, radio, television, major newspapers - are increasingly corporatized, governed by greed and partisan interests rather than by conscience or civic responsibility. As a consequence, it is necessary that we - as engaged citizens - find other channels through which to communicate, to express those views too unpopular to make the evening broadcast or Sunday edition. Due to the capacity of printmaking to generate relatively rapid and inexpensive multiples, artists with a desire to give voice to their own concerns and those of others have been drawn to the medium, using it to level their dissent and ask questions. Without intending to romanticize or diminish the power of a single image to transform culture (a modern day Guernica is always possible!) I would suggest that it is more likely that Art will induce change not through one radical work, but through the assiduous practice of careful examination and critique. (S)Edition is a showcase of this critical practice. It is testament to the unwavering aspiration of artists to - as renowned historian Howard Zinn suggests - transcend the established framework of society, to think outside the boundaries of permissible thought and dare to say things that no one else will say.